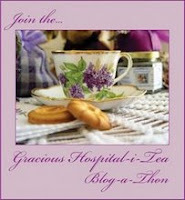 This week at Gracious Hospitality, the theme is teapots. 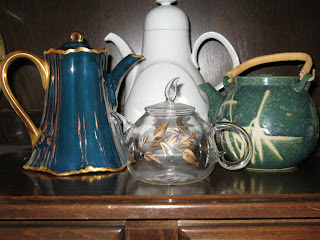 I only took pictures of my very favorites, as I counted up 14 + teapots in my house. Most of my teapots are just for display, but there are 3 or so that get used when we have a tea. This lovely rose tea-for-one is so cute! I found it a few months ago at a thrift store and I just had to have it. I really just enjoy looking at this one. I guess this one is my most recent teapot purchase. This white teapot is my favorite and gets used when I host a tea. It is one of the first teapots I ever bought myself. A few years ago, I was going to co-host my first tea and realized that it might help if I owned a decent teapot! I looked on e-bay and found this one. I was so delighted when I received it - it was prettier than I thought! Here are the rest of the favorites all together. The back one is from a thrift store - it's German and I was drawn to the clean lines. On the left is the blue/purple & gold teapot from the set that my Great Aunt hand-painted in high school (in 1928!) - I treasure it! The green oriental teapot on the right belonged to my mom and was used many times over the years. It holds good memories for me. The little clear teapot in front was purchased from Enjoying Tea for the purpose of displaying a blooming tea flower ball (if you've never seen one, the tea ball opens into a flower while it steeps) at a tea. That was a fun thing to do! 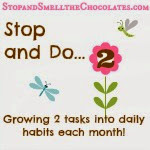 You can got to YouTube and look at lots of great little videos on blooming tea. I hope you enjoyed my teapots. To see many more wonderful teapots, be sure to stop by Gracious Hospitality. Beautiful pots. That's so interesting about the blooming tea. I'm going to check it out. Have a great day! Beautiful teapots! I am still in love with the china painted one made by your dear great-aunt. It's a real treasure! Aren't the blooming teas fun? I enjoy watching them blossom out in a clear glass teapot! We're having trouble with Mr. Linky this week and links past #14 aren't showing up. 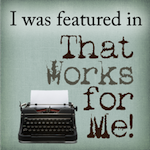 Would you mind re-linking, using the 'new' Mr. Linky box that I've posted right under the old one? I would appreciate it so much! Sorry to be a bother, but I don't want anyone to miss your post! Once you've done this, I'll delete your old link. Your white teapot is exquisite. I just love it! You have a very nice collection. Thanks for sharing! 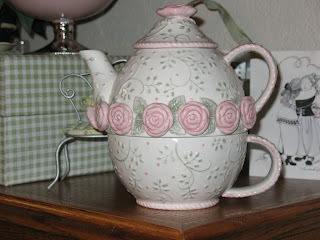 I really love pretty tea pots! I only have a generic silver one from walmart, but I'd like to get a unique one with character! Your teapots are so nice..I especially likr the rose one, and to think it was from a thrift shop! 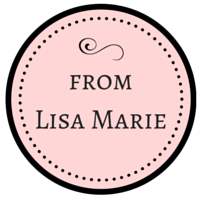 Great post, Lisa! My favorite is the white one from Ebay, but all of them are so pretty! I haven't gotten around to my tea pot post yet...I just did get Saturday's happenings on today! I'm so far behind! LOL! I've never heard of blooming tea before. It sounds like fun! Your teapots are great, such variety. Lisa, I love your teapots... Have never heard of the flowering tea ball so must follow your link to see it. Thanks! Back to say that that was amazing! How magical it would be...wonder where I can get them??? The one painted by your Great Aunt is incredible. What a treasure. You know, I don't even have a pretty teapot. You simply cannot raise three girls properly with out a pretty teapot, so you've inspired me to look around in some antique stores. Lovely pots! The white one is elegant looking and the painted one is stunning! Thank you for sharing. I see you are falling into the worl dof blogging easily. 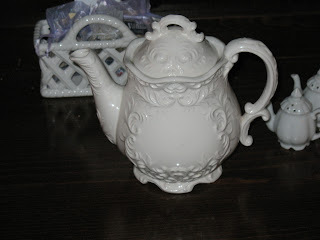 THe white teapot iwth scroll work is gorgeous. I also like the blue and gold as it reminds me of some prussian sets I have seen. I have one posted from Bavaria in gold if you would like to come take a look. I think you might like it too. Love the white teapot. I can see why you would use it a lot for tea because it would go with everything! Very pretty. You have a lot of darling tea pots. My fav is still the purple/blue that was painted by your great aunt. Great post! You have some lovely teapots. Thank you for sharing your story. What a great find at the thrift store! I really love the tea for one sets. I also like the cream-coloured teapot. It's so pretty! Lovely teapots! I especially like the tea-for-one set! Ooooh - I love your teapots! I collect them too and love seeing such beautiful ones. I love the white one you use for company - soooo very pretty.